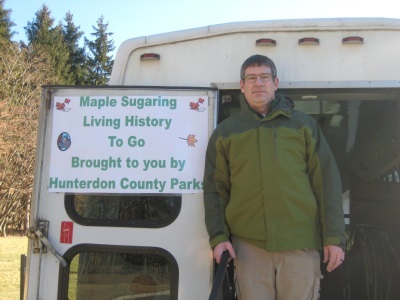 My name is Patrick Eckard, and I am a Recreation Leader at the Hunterdon County Division of Parks & Recreation. I have worked for the County for a total of 16 years, 6 years with the Parks. I grew up in Hunterdon County and I have a background in First Aid, camping, hiking, trail work, and canoeing/kayaking. I am an Emergency Medical Technician (EMT) with two Hunterdon County Rescue Squads. I am also a First Aid and CPR instructor with the American Heart Association. In my free time, I enjoy hiking, helping people, and reading. Here at the Parks I have many job titles. I am in charge of our Canoeing Hunterdon’s Waterways program, which is my favorite. The program includes canoeing as well as kayaking, which I love to do. I also teach many different things such as Knot Tying, Camping Skills, First Aid/CPR, Fishing, Hiking, and many more. Getting back to my favorite thing canoeing/kayaking, the Parks just received 10 new kayaks. This brings our numbers up to 14 kayaks and 28 canoes. The program starts April 14 with a flat water, pond paddle at the Clinton pond and the next day at Teetertown. A flat-water paddle versus moving water is a great way to learn how to handle a canoe or kayak. River trips start May 6, we go on the different sections of the Delaware River and on some small local rivers too. The Delaware trips are very good for first timers. This year with the ever-growing popularity of kayaks, a new Kayak Camp is planned. Participants can sign up for their own kayak instead of sharing a canoe. The camp runs July 30 to August 3. We will start on the pond and learn the basic of paddling and then move to the rivers with and overnight camp out Thursday into Friday. This camp is for children entering grades 8-12. I will also be offering Sports of a Lifetime Camp, where your child will learn the fundaments of golf and bowling, taught by professionals. Camp runs from August 13 -17th. New this year for me is Lego Camp, from July 23 to 27. Lego camp will run a morning and afternoon. The camp with STAR WARS is in morning and Animal Grossology is in the afternoon. If your child is signed up for both camps they can bring a lunch and stay right through until the afternoon camp is over. We also have Orchestra Camp from July 16 to 21. This camp is led by the Hunterdon Symphony and cumulates in a Friday night concert which I look forward to every year. It is amazing what the kids can do in the short time they are at camp. One of the most rewarding parts of my job is the Adopt-A-Trial Program. This program allows people to adopt a trail, or a whole trail system of the park to help maintain the trail for the public. Our County staff appreciate the help! The volunteers that adopt-a-trail help keep everyone safe by being our eyes and ears in the parks. The reports I get from them about downed trees and other hazards help us out immensely. A big thank you to all the volunteers, we really appreciate your assistance. If you would like at adopt a trail/park please contact me. The Hunterdon County Division of Parks & Recreation and the Scouts (girls & boys) have a great working relationship. Our staff offers a wide variety of classes to help them earn badges, for the younger groups and we also do merit badges. Some of the classes I offer are: Camping, Canoeing, Cycling, First Aid, Fishing, Geocaching, Hiking, and Orienteering. For Outdoor Skills I offer: Canoeing/Kayaking, Emergency Preparedness, CPR Certification, First Aid Certification, Orienteering, Geocaching 101, Hiking Knowledge, Backpacking Knowledge, Camping Knowledge, and Knife Safety. We also help Scouts achieve their Gold Award or Eagle Scout status. Some of the projects include building or repairing trails, building and painting new parks signs and many other interesting improvements. If you have an idea how to improve the parks or need help coming up with something give me a call to set up an appointment to meet with me, at the Arboretum. If you homeschool we can assist you with those challenges as well! Most of the programs we offer can be turned into class for you. Just contact us and we will set it up. I am offering a Homeschool Recreation series from February through May (every 2nd Wednesday) of the month. The fee is $20.00 for all four lessons from 3:00 pm to 4pm. This year I will be directing our award winning Maple Sugar program. It is a great way to learn and see first-hand how nature gives us some great tasting food. We will be offering tours for groups on February 28, March 1 and 2, call us to schedule your group. On the tour you will enjoy a Native American story about the discovery of maple sap, meet an early American Frontiersman tapping his trees and visit a sugar farmer at his evaporator boiling down the sap. At the end of the walk everyone will get a free taste of real maple syrup on a silver dollar pancake! Dress for the weather and join us. Our Open house will be on March 3rd, no reservations necessary! Last, but not least is my biggest responsibility, our annual Music Under the Stars, free summer concert series. Featured every year since 1977 the series offers symphonies, acapella, Big Band, Rock n Roll, Oldies to Country! We have had serval excellent tribute bands such as: the Best of the Eagles, Captain Jack, Tramps Like Us and British Invasion. This program's longevity is more than great music! Deer Path Park offers incredible vistas, especially at sunset, for spectators to enjoy. The park also offers plenty of room for the entire family to spread out a blanket, have a picnic dinner, and hold an impromptu game of frisbee and the little ones can enjoy the playground. They run every Thursday from June 28 through August 16, from 7:00 pm to 9:00 pm. I am busy now going through the various bands who would like to perform. There will be food vendors at the park or you can pack your own picnic dinner and purchase a delicious dessert. Our concerts are never cancelled, if the weather is threatening we will move inside to Hunterdon Central High School. This decision is made on concert day after 1:00pm. We will post it on our web/Facebook page as well as on our voice mail. Keep an eye on the web site for our Concert Brochure coming in April. It is my pleasure to hire some of our staff for the summer season running from June through August. I am seeking an intern to work with me and also someone who likes to canoe (experience would be helpful, but we supply training.) The applicant must live in New Jersey and have a valid NJ driver’s license and be 18 years or older. Please contact me at peckard@co.hunterdon.nj.us or call (908) 782-1158. Check our website for more information on the programs that I and my colleagues offer at www.co.hunterdon.nj.us.